In case you missed the news, PC sales have been down at worst and flat at best for several quarters. Obviously, that’s generally bad news for Team WinTel, aka: Microsoft(s msft) and Intel(s intc). Both companies, which have dominated the PC market on the hardware and software side for at least two decades, have taken steps to address this but one may have a new trick for old laptops at CES: Systems that effectively run both Windows and Android(s goog). This type of device isn’t new. 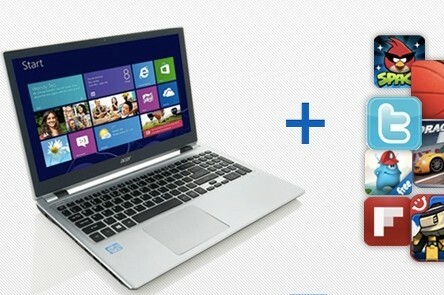 Take the Asus Transformer Book Trio for example: It looks like a traditional Windows 8 laptop with an Intel chip inside. 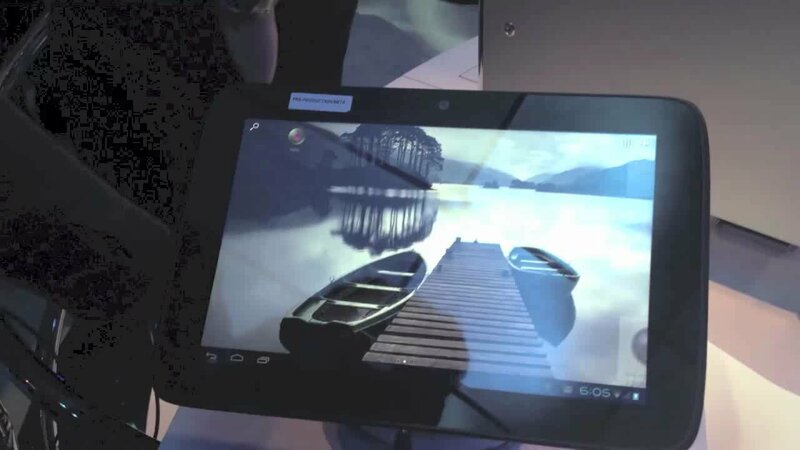 It also has a removable display where another lower-powered Intel chip resides so the display can act as a full-fledged Android tablet. The T300 base can still be used for Windows if connected to an external monitor. So what might be different at CES? Sources told The Verge that a twist on this approach could appear at next week’s Consumer Electronics Show; something called a Dual OS device. The difference here is that Android apps could run in a virtual machine inside of the Windows 8 environment, which makes it simpler for consumers. However, neither Microsoft or Google is on board, according to The Verge. I can understand why Microsoft might not be happy. 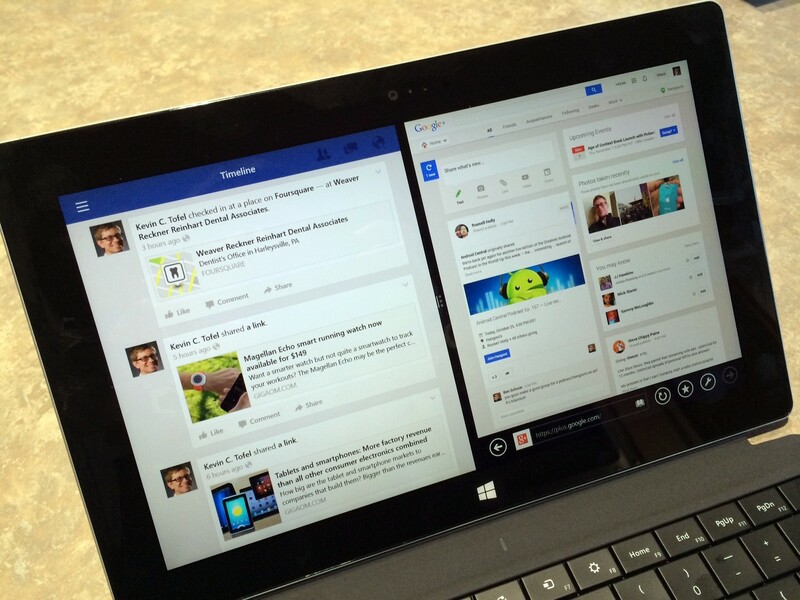 After all, aren’t the company’s own Surface products marketed as both a great laptop and a great tablet? I think Surface Pro 2 actually comes close, but still falls a little short of the mark for me. Regardless, if Microsoft’s biggest partner of all — Intel — supports such an anti-Microsoft move (for lack of a better term) it won’t likely be happy. As far as Google though? Why wouldn’t it want Android apps on anything that can run them? Google wins in this case because it captures more user data for its advertising model. And this approach of Android within Windows hasn’t been a problem before to Google: Bluestacks (which Intel is a partner with) has existed for some time offering Android apps in a Windows virtual machine. Heck, in June of 2012, Asus partnered with Bluestacks to pre-install the Android VM on 30 million computers and Google didn’t make a peep. Why should it? Regardless of who supports any potential Android in Windows project, the bigger question is: How much can it help the flagging PC industry? I think the idea of running Android apps will be appealing to some, but I wouldn’t expect a major turnaround in PC sales because of any such products. The solution — unless Intel has some secret sauce that we hear about next week — already exists with Bluestacks and yet PC sales are past their peak. We’ll likely hear more on this next week, of course. And it’s possible that whatever is announced or demonstrated has some wow factor I haven’t thought of. But I don’t see this move as a saving grace for the WinTel PC market. Instead, it looks more like Intel continuing to play the field and expand its options after deciding to support Android back in 2010. While the company is starting to get its chips in a few smartphones and tablets, the majority of mobile devices still run on ARM-based(s armh), not x86 chips. Unfortunately, the PC market may be beyond saving in the traditional sense. As hardware and mobile apps continue to mature, it’s becoming easier to offload more tasks to tablets and even smartphones. Perhaps a “Dual OS” device will simply be Intel’s way to ease the transition while providing you the chips coming and going from a PC to a post-PC world. Its good to hear that we can use both platforms in a single gadget. Sorry I am rofling! We – zealots of the pc market crying with bloody tears! Monkeys like tablets too! Ok, We can finally enjoy the power alone. We – Developers, Designers, Gamers – shaping your world and ideals. The power of fast processors, sli/crossfire gpus; convenient keyboards; eye appealing full scale monitors to play, create and develop is finally solely ours again! So grateful to Google and Apple raising generation of degeneration! Mobile devices FTW – make them even more dumb! Less competition – more job offers. Love when technology makes people stupid, it gives us right to deceive you and earn from you. Yay! Don’t buy PC/Laptops – they are bulky, make you think and have ugly keyboard! No way! Put your finger inside the nose then back to your touchscreen again, it is that simple! Cut fruits. read emails and news! Let me sit and rot myself with 4xTitans and 6xCore processors with 3 monitors and feel myself lost and ashamed that the market segment I love is lost forever, while creating another 3d model for a stupid movie you watch in cinema. “I feel so crumbled” that people having brains originally incompatible with ideas, modelling and abstract thinking are finally leaving bulky machines to rest. Intel talk the talk, at the very least. They recognise that to compete in the post PC market their processors need to be in devices that are low cost, low power and deliver high performance. Out of those three factors, pricing will prove to be the most testing. But if these new Dual OS devices are affordable, then the concept could theoretically work, for Intel, at least. Although whilst this concept makes sense for Intel, it is of little surprise to learn that Microsoft are not on board with the project. If Dual OS devices were to gain significant prominence, Microsoft would be relegated from the position of all-dominant desktop OS developer, to a software company with a product that delivers Google services. Yes, the likes of Office would survive, but Microsoft would look less like a genuine rival to either Google or Apple. One pricing factor that Intel can’t directly control is the cost of a Windows licence. If this were to prove too expensive, or even too restrictive, Dual OS devices would struggle to compete. There is not only Android and iOS to contend with – Chromebook sales are surging, and the likes of LG will be pushing a new generation of Chrome OS products this year. I can see many business and consumers ready to move forward to Android as a replacement for Windows jumping on this. They can move to Android for new applications and still run legacy Windows software until the need fades in a few years. Pc gaming is only for those who are dedicated. You can build a good rig for about $500 but it will have its limitations. Or you can buy one. If you buy one make sure you get one that has upgrade capabilities and will not out date in a few years. Right now Android has 81% of all new smart phone sales, but while that looks impressive they are still way behind Apple in tablets. This might change in the future of course, but right now there are not too many Android Apps to make the Android tablet attractive. What Intel urgently need to do is get Android working efficiently on their Atom chips running in x64 mode. It seems that they are working on this but Android is a moving target, Google are currently transitioning out of Dalvik the Android Java Virtual Machine to Android Run Time ART where Apps are compiled to machine code to increase performance and battery life. Dalvik was previously improved by adding a Just In Time compiler. The problem for non ARM chipset makers like Intel is the amount of work required to port given that Google have taken years to get so far for ARM. Bluestacks is several years behind the Android evolution running Dalvik in interpreter mode only, add the virtualisation overhead and its not that attractive especially on tablets due to battery drain. If and when Intel get Android working on x64, Microsoft could modify the compilation process to replace key foundation classes so that Android Apps run natively on Windows Phone and 8. We used to have 1 PC, and a laptop in the house. Now we have 1 PC, a laptop, 4 surfaces and a NookHD. I’d say the PC market is doing just fine. Just depends on what you consider a PC. But how long ago did you buy your PC and laptop, and how long did you buy your tablets? PCs are different tools than what most people use for simpleton realities, the need for PCs will likely reduce down to the actual size of the “industry” market once again with specialty companies niching their way to prominence and prestige, once again. can you imagine the transition from autos to aerocars?